This page details the changes we made to the second vehicle, Daphne II. Fortunately, following the accident we were able to recover much of the kit we had previously purchased for Daphne I. This was the primary reason we decided to buy another Land Rover, though it was not easy to find one. 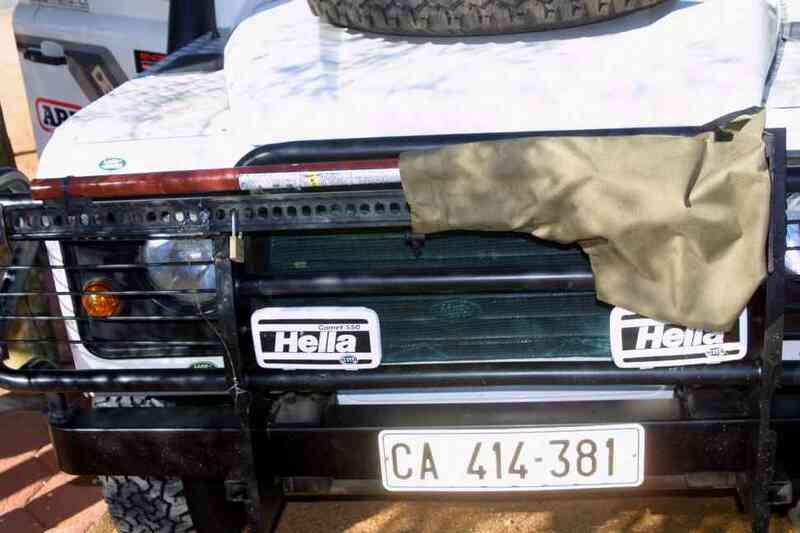 There were only a few vehicles available in Cape Town, and those we saw were either over-priced or required considerable mechanical work. 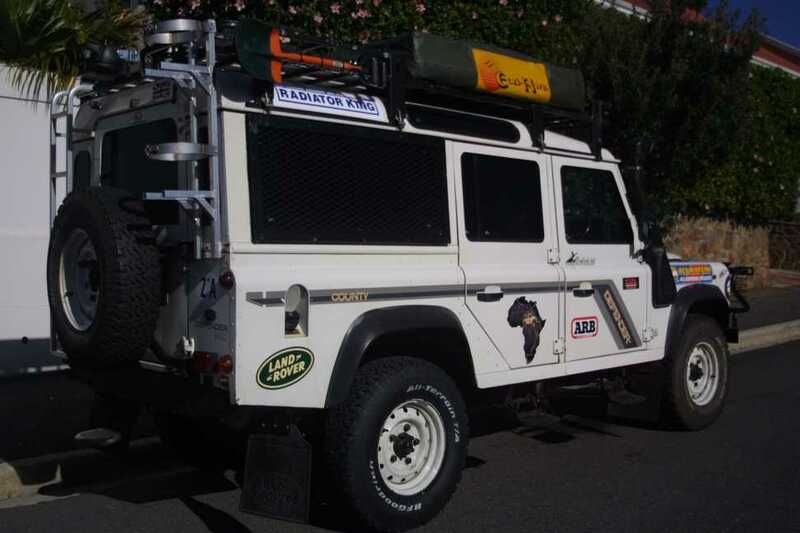 In the end Adrian flew to Jo'burg, as Land Rover South Africa (who were helping with our search) informed us that there was a Land Rover Defender available in Midrand. This vehicle apeared to be mechanically sound, and drove well, so we decided to buy it (thanks to Gary and Sarah and Jacques for having a look at it prior to Adrian's flight). 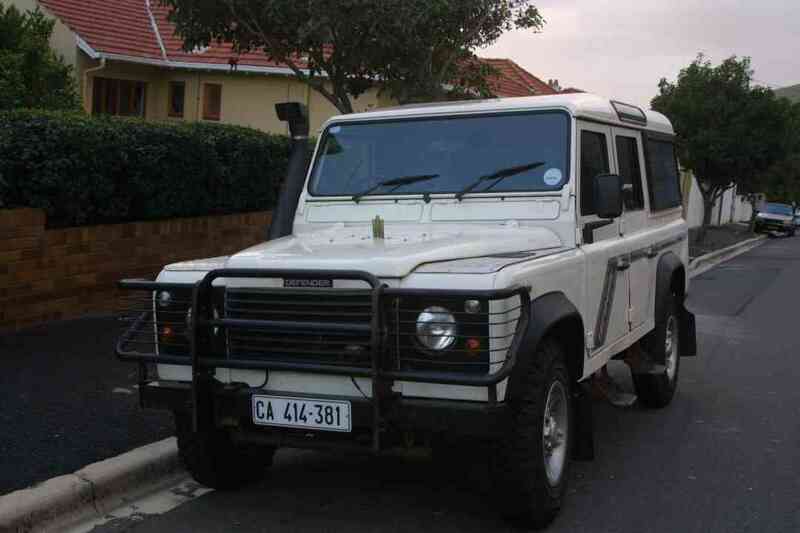 Adrian drove it back to Cape Town on 16 May. 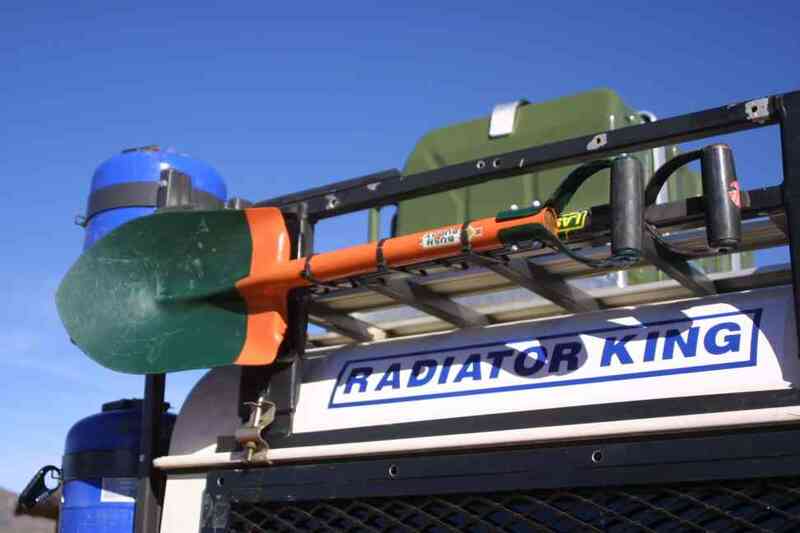 The second vehicle was already equipped with a roof rack, bull bar, snorkel, roof rack and second battery charging system. 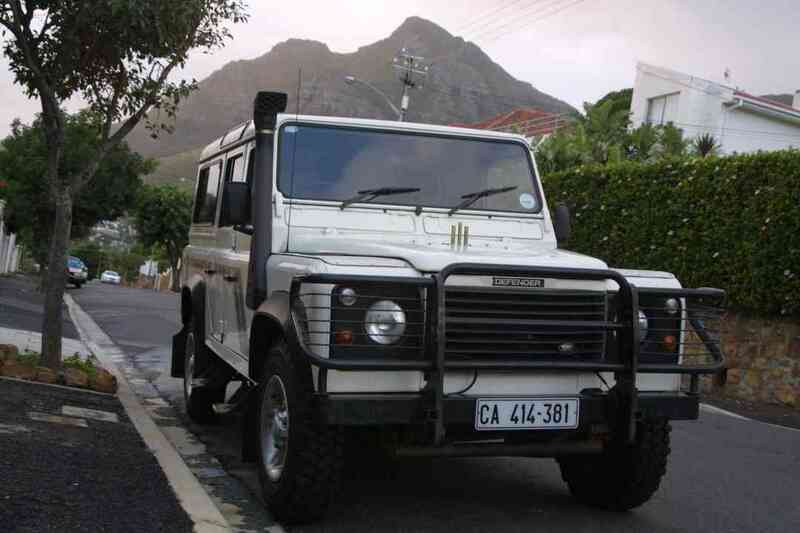 Whilst Adrian was in Jo'burg he bought the Old Man Emu (OME) suspension kit. You will remember that we debated whether to do this for the original vehicle and in the event decided against it (see Vehicle Page) button on left hand side for further details. After the accident we thought we would spend some of the insurance money on OME - the vehicle we bought was cheaper than the original one so there was enough in the budget for this. The rear springs are rated for a permenant extra load of 300kg. This is OK for the journey, but on reaching the UK and unloading our equipment, we will need to change them. The first task was to have a mechanical check on the vehicle. 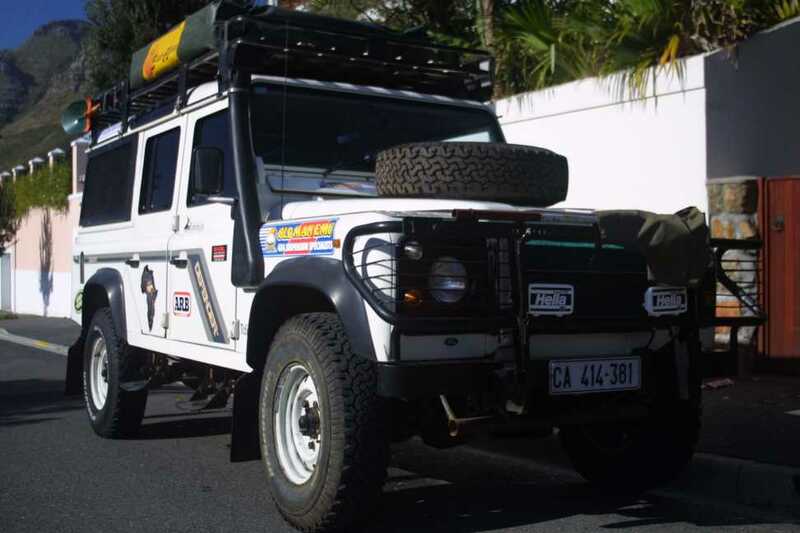 Whilst Adrian had been content with the performance on the journey from Jo'burg to Cape Town, he had since noticed that when loaded, Daph II was underperforming on hills. The garage (LR Services) thought the problem could be the injectors and fuel pump, so these items were sent to a third party for re-conditioning. This took over a week, and when the parts were returned and fitted, there was a positive difference. However, the day after Daph II returned from the garage, she refused to start. It turned out the problem was a faulty washer on the fuel pump - put on in haste, so diesel leaked within the engine on each compression stroke of the starter motor. Once the washer was replaced, she performed well. The next thing was the electrics. Adrian spent 9 hours with the auto electrician, re-wiring Daph II and fitting the dual battery system from Daph I. This helped him to better understand the circuitry. After this was finished, Daph II was taken for window tinting - for security and safety - the tints contained a safety film to stop the windows splintering in the event of an accident. The rear passenger windows, the back sliding windows, the fanlights and the back door were all tinted, and a clear film was put on the driver and front passenger windows. 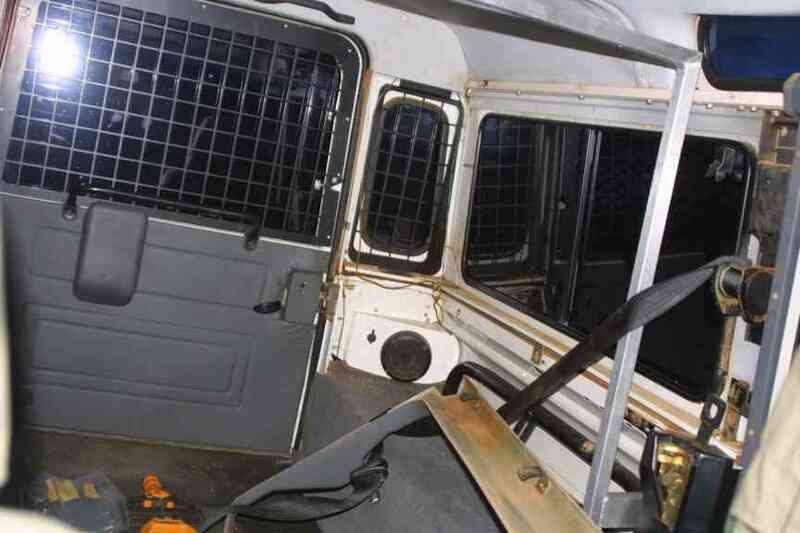 Afterwards, window grilles were fitted inside the back windows and outside the sliding windows, for added security. 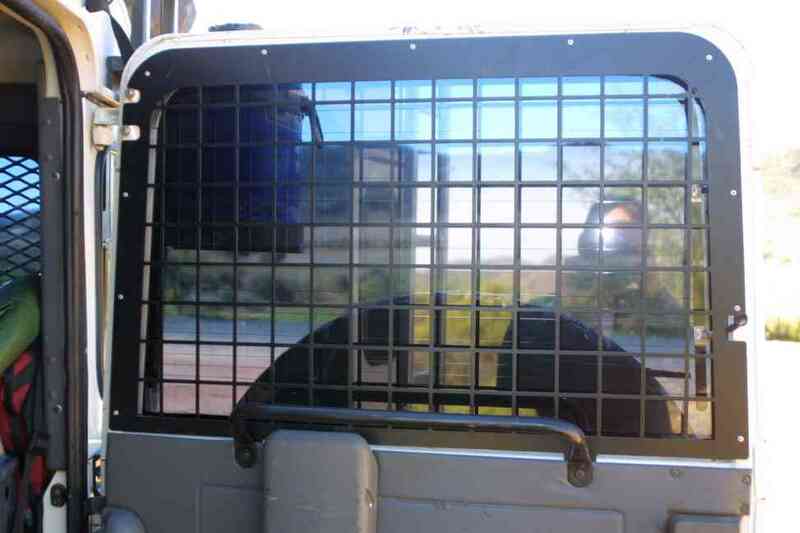 Previously we had only fitted grilles on the sliding windows, but Adrian had since found a set of Mantec window guards, imported from the UK by BRS Off Road Services in JBG, for the rear door. Next, the extra 45 litre fuel tank was bolted on. This had been recovered intact from the original vehicle, as had the rear spare wheel swing arm, which was then put on the rear door. We had decided to take a second spare wheel, but we wanted to keep the weight off the roof. With this model of Defender, a bonnet strengthening kit is required in order carry a wheel on the bonnet - otherwise the vibrations are likely to cause damage to the injectors. These kits are not cheap, but we thought it worthwhile in the light of our accident. The highlift jack was fastened to the front of the bull bar - we had it in this position on Daph I, but since the bullbar on Daph II was different, we had to use a different method of fixing the equipment. We also had to mount square front spotlights instead of round ones. Whilst visiting a new off road shop in Cape Town (not that we need any more equipment! ), we saw an Austrailian tent (originally named 'the Oztent'!) that has an interesting design, which enables one person to erect the tent easily and quickly, using only one arm (important for Catherine until she regains a full range of movement in her right shoulder). It appealed to us as we could stand up inside (impossible in the dome tent) and link the awning to the back of the vehicle in case of rain. It meant we would be able to cook under the awning in bad weather. There is integral mosquito proofing, and we would easily be able to work on the computer using power from the vehicle. We decided to test one, thus we are importing a tent and will sell our original spare dome tent. The only disadvantage is that the length of the tent when collapsed is 2 metres, and we would rather carry it inside Daph II than put it on the roof, so we will have to find a way to store it somehow within the vehicle. 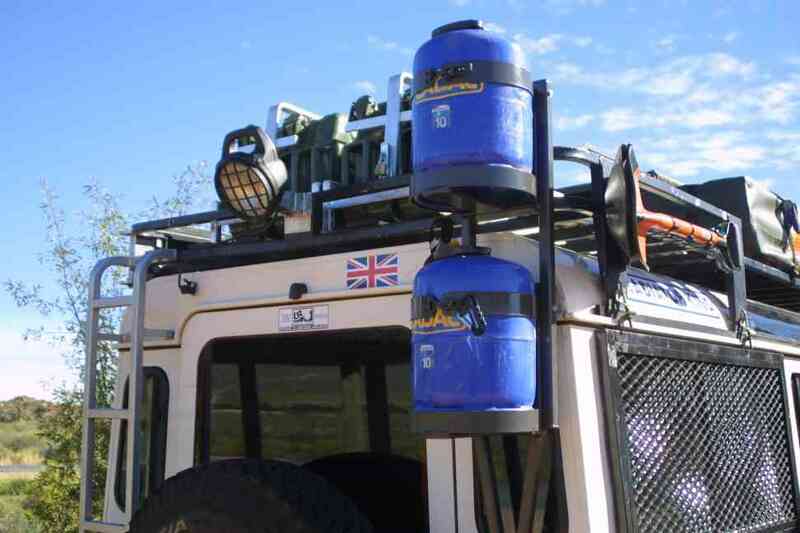 Although there were jerry can holders on the roof rack, when we tried to put our jerrycans into them they were too small, despite making adjustments to the rack. Because of this and the fact that there was no way of locking the holder, we decided to buy new holders, and position it in the centre and rear of the roof rack. We also had to buy a second gas bottle holder, as the first we had made was not well fitting and we were only able to close the bracket on the top cylinder with great difficulty. We had put Tread Seal in the tyres of the original vehicle in order to help avoid punctures, and we decided to do this again. However, when driving after the material had been injected into the tyres, we noticed that the car was vibrating very strongly, more so on the passenger side than that of the driver. At first we were worried that there was a problem with the engine, but we decided to contact the Tread Seal representative first. He suggested that we get the wheels cleaned out and balanced (though they were supposed to have been cleaned previously). This was done, and the Tread Seal was taken out, which appeared to resolve the problem. All the same, we decided that we would try again, as the Tread Seal rep in Cape Town had volunteered to come to us the following day to re-insert the Tread Seal - this was helpful, as we were planning to leave on that day. The same day as the problems with Tread Seal occured, Adrian noticed that there was a diesel leak on one of the injectors (these had earlier been taken out and re-conditioned). This meant that he had to take Daph II back to the garage for the leak to be fixed - not an easy task for a Friday afternoon in Cape Town, but it was sorted out by the end of the day, along with a leaking rear diff seal. We would like to thank all those who helped us prepare Daph II in double quick time. 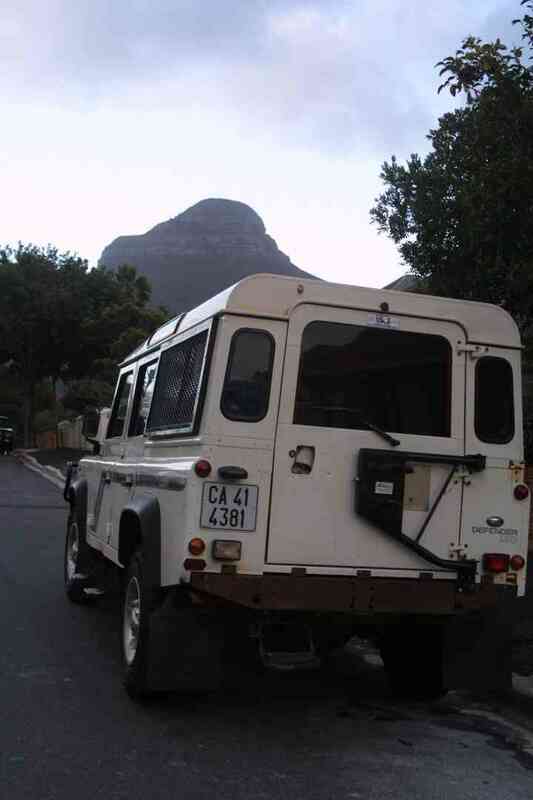 Land Rover Cape Town were instrumental in helping us source a new vehicle (through Land Rover SA), while LR Services helped with the technical servicing and parts. A special thanks to Hammy and his Mace Service Centre - Hammy and Adrian spent many long and late hours fitting the accessories recovered from Daph I onto the new vehicle - without his help it would have been a far longer and more difficult process. Thanks also to Cristy Sports for re-patching the roof tent, which was fitted by Just Done It, along with the awning; and to Hannibal, who helped at the last minute with the jerry and gas bottle holders.